The short-term retention of sensory information in working memory (WM) is known to be associated with a sustained enhancement of neural activity. What remains controversial is whether this neural trace indicates the sustained storage of information or the allocation of attention. To evaluate the storage and attention accounts, we examined sustained tactile contralateral delay activity (tCDA component) of the event-related potential. The tCDA manifests over somatosensory cortex contralateral to task-relevant tactile information during stimulus retention. Two tactile sample sets (S1, S2) were presented sequentially, separated by 1.5 s. Each set comprised two stimuli, one per hand. Human participants memorized the location of one task-relevant stimulus per sample set and judged whether one of these locations was stimulated again at memory test. The two relevant pulses were unpredictably located on the same hand (stay trials) or on different hands (shift trials). Initially, tCDA components emerged contralateral to the relevant S1 pulse. Sequential loading of WM enhanced the tCDA after S2 was presented on stay trials. On shift trials, the tCDA's polarity reversed after S2 presentation, resulting in delay activity that was now contralateral to the task-relevant S2 pulse. The disappearance of a lateralized neural trace for the relevant S1 pulse did not impair memory accuracy for this stimulus on shift trials. These results contradict the storage account and suggest that delay period activity indicates the sustained engagement of an attention-based rehearsal mechanism. In conclusion, somatosensory delay period activity marks the current focus of attention in tactile WM. Working memory (WM) allows for the sustained representation of information that is no longer perceptually present. Many WM tasks involve the retention of a specific stimulus attribute for comparison with a test stimulus, presented after a retention delay. Neural activity that persists during this delay is thought to reflect the sustained representation of information in memory (Wang, 2001; but see also Nairne, 2002; Sreenivasan et al., 2014). Sustained delay period activity has been found in prefrontal cortex (Fuster and Alexander, 1971; Romo and Salinas, 2003) and modality-specific sensory brain regions (touch: Kaas et al., 2013; Zhou and Fuster, 1996; vision: Sereno and Maunsell, 1998). Although elevated delay period activity is commonly observed in frontal and parietal areas, this activation may not directly reflect the retention of stimulus-specific information (e.g., Riggall and Postle, 2012), and could instead be linked to top-down attentional control aspects of WM tasks (Lewis-Peacock et al., 2012; LaRocque et al., 2013; Sreenivasan et al., 2014; Postle, 2015). The sustained representation of memorized features or objects is likely to be implemented in sensory-perceptual brain areas (Curtis and D'Esposito, 2003; Jonides et al., 2005; Pasternak and Greenlee, 2005; Postle, 2006; D'Esposito, 2007; Emrich et al., 2013), even when these areas do not show sustained increases in delay period activity that can be measured with fMRI (e.g., Harrison and Tong, 2009; Riggall and Postle, 2012). Event-related potential (ERP) studies of WM have revealed sustained delay period activity with modality-specific neural generators. The tactile contralateral delay activity (tCDA) (Katus et al., 2014) and its visual counterpart CDA (e.g., Vogel and Machizawa, 2004) emerge when tactile or visual stimuli on one side are retained for comparison with subsequent test stimuli as an enhanced negativity over somatosensory or visual brain regions contralateral to the memorized stimulus set. Although these components are usually interpreted as electrophysiological markers of information storage in contralateral sensory areas (e.g., Vogel and Machizawa, 2004), they could also reflect a lateralized allocation of attention resources (van Dijk et al., 2010). In this study, we used the tCDA component to determine whether lateralized somatosensory delay period activity reflects the retention of sensory information (storage account) or the current focus of attention in WM (attention account). Two bilateral tactile sample sets were presented sequentially. Each set involved a left- and a right-hand pulse. Participants memorized the location of one pulse per set and judged whether one of these locations was stimulated again at memory test. Critically, the two task-relevant pulses were unpredictably presented to the same hand (stay trials) or to different hands (shift trials). If the tCDA component indicates retention of tactile information in contralateral somatosensory cortex, it should disappear on shift trials, where stimulus locations have to be simultaneously retained on opposite hands. If it instead reflects the focus of attention in WM, the polarity of the tCDA should reverse on shift trials after the second sample set has been presented, due to the reallocation of attention toward the most recently encoded item. Brain activity was acquired from 12 neurologically unimpaired adult participants (mean age 32 years, range 25–41 years, 6 male, 9 right-handed). All participants gave informed written consent before testing. The study was conducted in accordance with the Declaration of Helsinki and approved by the Psychology Ethics Committee of Birkbeck College. Participants were seated in a dimly lit recording chamber with their hands covered from sight, viewing a monitor that showed a central white fixation cross against a black background. Eight mechanical tactile stimulators (four per hand) were attached to the distal phalanges of the index, middle, ring, and small fingers of the left and right hands. Stimulators were driven by custom-built amplifiers using an eight-channel sound card (M-Audio, Delta, 1010LT) controlled by MATLAB (MathWorks). Continuous white noise masked sounds produced by tactile stimulation. All tactile stimuli were mechanical 100 Hz sinusoids (duration: 50 ms; intensity: 0.37 N). The stimulation procedure involved two successive sets of bilaterally presented sample stimuli that were followed by a single test stimulus (Fig. 1A). The two sample sets (S1, S2) were separated by a 1.5 s delay, and the memory test stimulus followed S2 after additional 1.5 s. Each sample set consisted of a left-hand and a right-hand pulse. The pair of S1 pulses was simultaneously presented to one finger of the left and right hand, with left and right stimulus locations determined randomly and independently for each hand. The two S2 pulses were separated by an interstimulus interval of 0.2 s. The order of S2 presentation (left-hand pulse preceding right-hand pulse, or vice versa; Fig. 1B) was randomly determined on each trial. The location of the two S2 pulses was randomly and independently selected, except that the two fingers that had already received an S1 pulse were not stimulated again. A unilateral memory test stimulus was presented 1.5 s after the first S2 stimulus to one finger of the left or right hand. A, Stimulation protocol. Two bilateral sample sets (S1, S2) were followed by one unilateral test stimulus. Each sample set involved two tactile pulses, one per hand, which were presented simultaneously for S1 and sequentially for S2. Only one pulse was task-relevant per sample set, and this was determined by spatial position for S1 (left or right hand) and temporal position for S2 (early or late pulse). B, Experimental conditions, illustrated for blocks where participants had to remember the right-hand S1 pulse, and the early (top row) or late (bottom row) S2 pulse. The task-relevant sample stimuli (marked by black dots) were presented to the same hand on stay trials (left column) and to different hands on shift trials (right column). Stay and shift trials varied randomly and unpredictably within each block. Participants' task was to judge whether one of the two memorized locations was stimulated again at memory test. Memory match trials (B1, B4) and mismatch trials (B2, B3) were equiprobable. Participants had to memorize the locations of two cued sample pulses (one per sample set) and decide whether one of the two memorized locations was stimulated again at memory test. Which tactile pulses were task-relevant was specified at the start of each block. Participants were instructed to remember the S1 pulse delivered to one of the two hands, and either the first or the second S2 pulse (which was equally likely to be presented to the same hand as the S1 pulse or to the other hand). The hand that was task-relevant for S1 (remember left-hand or right-hand S1 pulse) alternated between successive blocks. Six of the participants memorized left-hand S1 pulses in the first block, and the other six started the experiment by memorizing right-hand S1 pulses. The task-relevant temporal position of S2 (remember early or late S2 pulses) changed after six successive blocks, with six participants memorizing early S2 pulses in the first half of the experiment, and the others memorizing late S2 pulses in their first six blocks. Unilateral test stimulus pulses were delivered to one of the two fingers that had previously received a task-relevant S1 or S2 pulse (match trials, 50%) or to one of the other six fingers (mismatch trials, 50%). Participants were instructed to respond vocally (‘a’ for match trials, ‘e’ for mismatch trials) during the 1700 ms period after test stimulus onset, when a question mark replaced the fixation cross on the monitor. Vocal responses were recorded by a headset microphone. The next trial started after a random interval of 0.4–0.6 s after the end of this response period. The experiment included 12 blocks with 40 trials each. One training block of 40 trials was run before the first experimental block. Another training block was run before the seventh experimental block, when task instructions regarding the temporal position of the task-relevant S2 pulse changed. Instructions stressed accuracy over speed and the need to avoid head and arm movements, and to maintain central gaze fixation. Feedback on task performance was provided on the computer screen after each experimental block. EEG data recording and analysis. EEG data were DC-recorded at 500 Hz from 64 active Ag/AgCl electrodes at standard locations of the extended 10–20 system, using a BrainVision DC amplifier. A bipolar outer canthus montage (horizontal electrooculogram) monitored lateral eye movements. Continuous EEG data were referenced to the left mastoid during recording, offline rereferenced to the arithmetic mean of both mastoids, and were submitted to a 40 Hz low-pass finite impulse response filter (Blackman window, filter order 664). EEG epochs for the 3 s interval following the onset of the first sample set (S1) were corrected relative to a 200 ms prestimulus baseline. Blind source separation of EEG data was performed with the Independent Component Analysis algorithm provided by the EEGLab toolbox (Delorme and Makeig, 2004). Independent components related to stereotypical artifacts at anterior scalp regions (eye blinks, vertical and lateral eye movements) were identified by visual inspection (compare Delorme et al., 2007) and subtracted from the EEG data. Lateral eye movements occurred on average on 5.6% of all trials, as indicated by a differential step function (step: 100 ms; threshold: 24 μV), running on the bipolarized horizontal electrooculogram before Independent Component Analysis-based artifact correction. None of these epochs was marked by the same step function after EEG data had been corrected for lateral eye movements. Artifact rejection and the interpolation of noisy EEG channels were performed using Fully Automated Statistical Thresholding for EEG Artifact Rejection (FASTER) (Nolan et al., 2010); 86.2% of all epochs were retained for statistical analyses (stay condition: 87.9%; shift condition: 84.5%), after artifact rejection and elimination of incorrect response trials. ERPs from six electrodes at lateral central scalp regions (FC3/4, FC5/6, C3/4, C5/6, CP3/4, CP5/6) were separately averaged for ROIs contralateral and ipsilateral to the task-relevant S1 pulse. Statistical analyses were based on mean amplitudes of contralateral/ipsilateral difference values for the S1 period (500–1500 ms after S1 onset) and the S2 period (500–1500 after S2 onset). In line with previous work (e.g., Katus et al., 2014), the tCDA measurement time window for the S2 period started 300 ms after the potentially task-relevant late S2 pulse (which was presented 200 ms after the early S2 pulse). To ensure that measurement time windows were equally long for the S1 and S2 periods, the time window for the S1 period started 500 ms after the simultaneously presented S1 pulses. Data in spline-interpolated topographical voltage maps were collapsed across trials in which memory was required for the left- or right-hand pulse, by flipping electrode coordinates in left-hand memory trials over the midline. 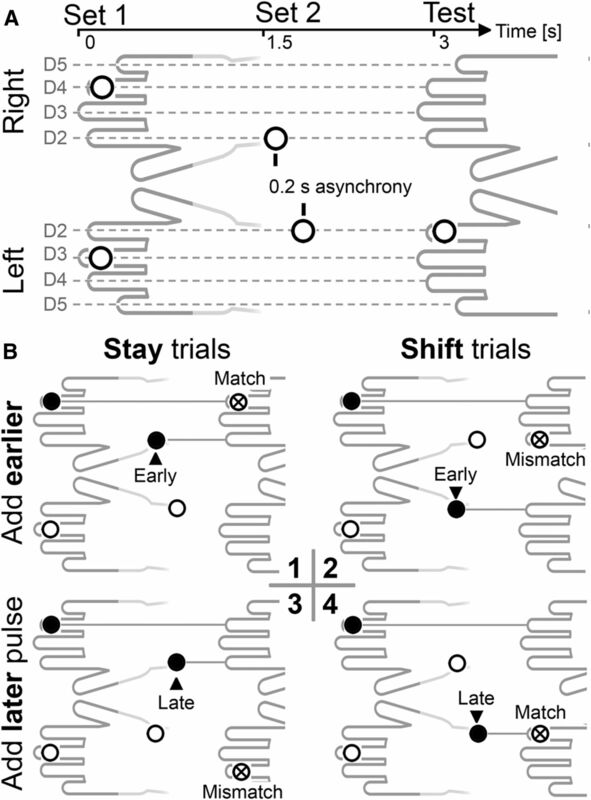 EEG data were collapsed across experimental blocks where the left- or right-hand S1 pulse was task-relevant, and blocks where the early or late S2 pulse was task-relevant, to focus on the critical comparison between stay and shift trials. Error bars in graphs showing difference values indicate 95% confidence intervals (CIs), which were calculated for each condition by t tests against 0 (i.e., no lateralized effect). Statistical significance of difference values is symbolized by asterisks and is marked by error bars (or colored shadings in the ERP plots) that do not overlap with the 0 axis. Figure 2 shows ERP waveforms for stay and shift trials during the 3 s interval following the onset of the first tactile sample set (S1). ERPs were averaged across lateral central electrodes (FC3/4, FC5/6, C3/4, C5/6, CP3/4, CP5/6) contralateral and ipsilateral to the task-relevant S1 pulse. The overall retention delay is divided into the S1 period (0.5–1.5 s after S1; memory load = 1 item) and the S2 period (0.5–1.5 s after S2; memory load = 2 items). Difference waveforms (Fig. 2, bottom) were calculated separately for stay and shift trials by subtracting ERPs ipsilateral to the task-relevant S1 stimulus from contralateral ERPs. Statistical analyses were conducted on mean amplitudes of these difference values in the S1 and S2 periods. Difference values that deviate significantly from 0 indicate the presence of reliable lateralized effects. ERPs recorded over somatosensory scalp regions contralateral (bold line) and ipsilateral (thin line) to the memorized S1 pulse. Task-relevant S1 and S2 pulses were located on the same hand (green) on stay trials. On shift trials, they were located on different hands (red). Topographical difference maps represent the scalp distribution of lateralized effects in the S1 and S2 periods in stay and shift trials. These maps represent the contralateral minus ipsilateral amplitude differences (defined relative to the side of the task-relevant S1 pulse). Difference waves were obtained by subtracting ipsilateral ERPs from contralateral ERPs. Shaded areas represent 95% confidence intervals (CIs) for tests against 0 (i.e., no lateralized effect). Time points when these shaded areas do not cross the x-axis (y ≠ 0) indicate the presence of significant lateralized effects. A sustained negativity (tCDA component) was present contralateral to the task-relevant S1 pulse in the S1 period, as indicated by difference values that were significantly different from 0 in both stay and shift trials (stay trials: t(11) = −5.174, p < 0.001, average −0.69 μV; shift trials: t(11) = −4.827, p = 0.001, average −0.67 μV). Because the side of the task-relevant S2 pulse was unpredictable, tCDA amplitudes on stay and shift trials did not differ during the S1 period (p > 0.7). In the period after presentation of S2, tCDA amplitude further increased on stay trials, relative to the tCDA measured during the S1 period (t(11) = −3.461, p = 0.005). Critically, tCDA polarity reversed during the S2 period on shift trials, resulting in a statistically robust sustained negativity contralateral to the memorized S2 pulse in this period (test against 0: t(11) = 3.472, p = 0.005). To avoid statistical comparisons of difference values with opposite signs (i.e., tCDA components with different polarities), analyses of the tCDA during the S2 period were conducted on difference values that were calculated by subtracting ERPs ipsilateral to the task-relevant S2 stimulus from contralateral ERPs. Difference values were corrected relative to a 0.2 s baseline before S2 onset. The new baseline ensured that reliable lateralized effects triggered by the presentation of S2 (i.e., memory update effects) were marked by tCDA amplitude values that significantly differed from 0. As shown in Figure 3, robust tCDA components were found during the S2 period for stay trials (t(11) = −7.082, p < 10−4) and shift trials (t(11) = −7.954, p < 10−5). A repeated-measures ANOVA with the factors trial type (stay vs shift) and relevant S2 pulse (early vs late) revealed a highly significant main effect of trial type (F(1,11) = 20.013, p < 0.001), and formally confirmed that the memory update effect on tCDA difference values was considerably larger in shift trials (−1.24 μV) relative to stay trials (−0.56 μV) (Fig. 3). There were no tCDA differences between early and late pulses (p > 0.6). Memory update effects on tCDA amplitudes following the presentation of S2 pulses, relative to a 0.2 s baseline before S2 onset. The net change of tCDA amplitude during the S2 period was larger in shift relative to stay trials. Difference waveforms were calculated by subtracting ERPs ipsilateral to the task-relevant S2 pulse from contralateral ERPs. Shaded areas around the difference waveforms for stay (green) and shift trials (red) represent 95% CIs for tests of lateralized effects against 0. Difference maps represent the scalp distribution of lateralized effects in stay and shift trials. Bar graphs represent mean tCDA amplitude during the S2 period on stay and shift trials in blocks where the early or late S2 pulse was task-relevant. Error bars indicate 95% CIs for tests against 0. To assess whether the tCDA components to S1 and S2 differed in size, we compared tCDA amplitudes in response to S1 (measured relative to the pre-S1 baseline) and to S2 (relative to a new pre-S2 baseline) on stay trials. The tCDA was numerically larger in the S1 period than in the S2 period (−0.69 μV vs −0.56 μV), but this difference was not significant (p > 0.3). Participants responded correctly in 94.5% of all trials (stay trials: 96.8%; shift trials: 92.1%). Sensitivity indices (d′) entered a three-way repeated-measures ANOVA with the factors trial type (stay vs shift), relevant S1 pulse (left vs right hand), and relevant S2 pulse (early vs late) (compare Fig. 4A). A main effect of trial type showed that task performance was impaired on shift trials relative to stay trials (F(1,11) = 19.439, p = 0.001). No further effects or interactions were statistically reliable (all p values > 0.3). A, Sensitivity indices (d′) for stay and shift trials, shown separately for blocks where the early or late S2 pulse was task-relevant. Performance was reduced on shift trials (white bars) relative to stay trials (black bars). B, Hit rates on trials where the test stimulus matched the location of the task-relevant S1 or S2 pulse, shown separately for stay trials (black bars) and shift trials (white bars). Performance on shift trials was not impaired when the test stimulus matched the memorized S1 pulse relative to trials where it matched the S2 pulse. *p < 0.05; **p < 0.01; ***p < 0.001; ns, not significant. 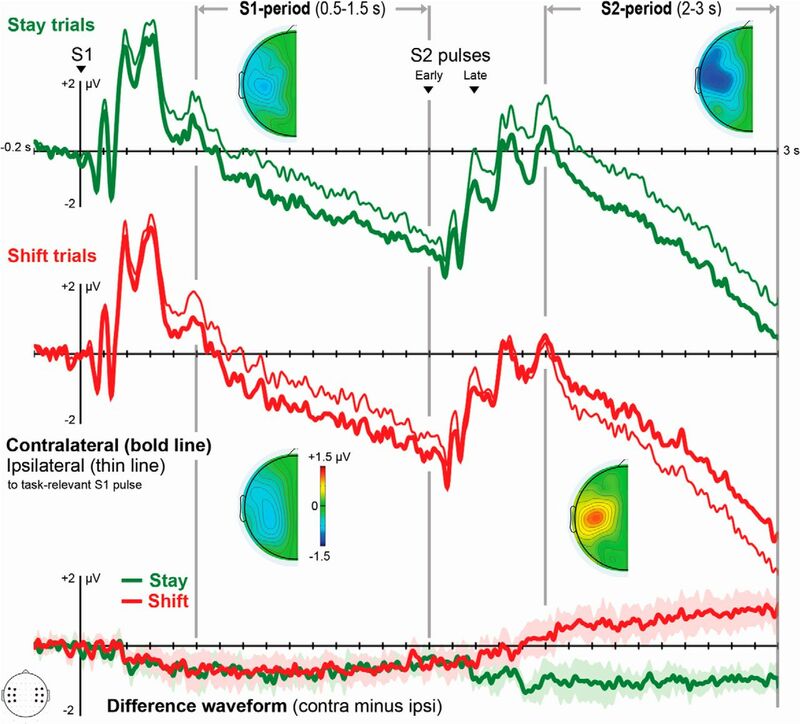 The polarity of the tCDA component during the S2 period on shift trials was determined by the location of the memorized S2 pulse (Fig. 2). Seeing that, we examined whether the absence of delay period activity contralateral to the location of the task-relevant S1 pulse on these trials was linked to impaired memory accuracy for S1. Hit rates were calculated separately for trials where the test stimulus matched the location of the memorized S1 or S2 pulse (Fig. 4B). A two-way repeated-measures ANOVA with the factors tested item (S1, S2) and trial type (stay, shift) confirmed the reduced task performance for shift versus stay trials (F(1,11) = 17.556, p = 0.002) but did not reveal further statistically reliable effects or interactions (all p values >0.2). Critically, hit rates on shift trials were not significantly reduced when memory was tested for S1 or S2 pulses (91.8% vs 92.8%; p > 0.5). 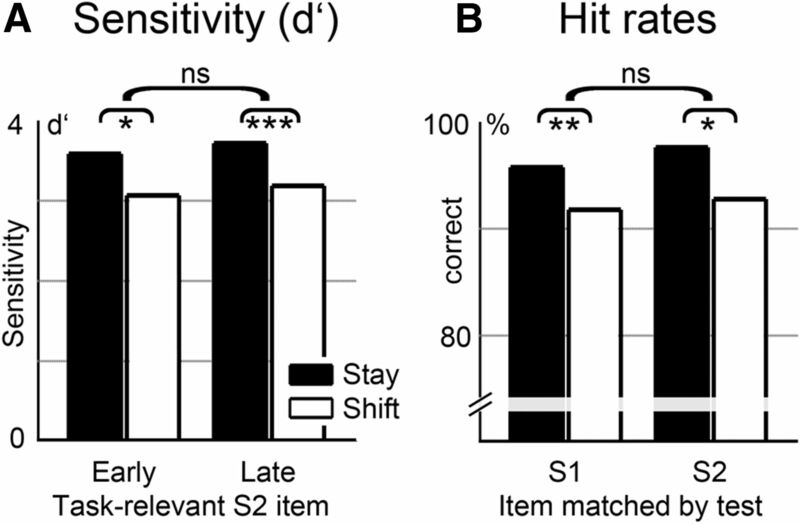 Hence, the loss of delay period activity sensitive to the location of task-relevant S1 stimuli during the S2 period on shift trials was not accompanied by a selective impairment in retaining this information. The tCDA component and its visual counterpart (CDA component) both reflect different levels of neural activity between hemispheres during the retention of tactile or visual information in WM. This hemispherical asymmetry may directly reflect the storage of information in contralateral sensory cortex (storage account) (e.g., Harris et al., 2002), or alternatively, the lateralized focus of spatial attention (attention account) (e.g., van Dijk et al., 2010). To dissociate these two accounts, we used a tactile memory matching paradigm in which WM was sequentially loaded with two tactile stimuli, one per sample set (S1, S2). Participants memorized the location of one pulse per sample set and decided whether any of these two locations was stimulated again at memory test. The memorized stimuli were located on the same hand (stay condition), or on different hands (shift condition), and tCDA components were measured during the periods that followed the presentation of S1 and S2 pulses. For the S1 period, we predicted a tCDA component over somatosensory cortex contralateral to the relevant S1 pulse in both stay and shift trials. In the S2 period of shift trials, storage demands were spatially balanced because the relevant tactile stimuli had to be retained at different hands. If the tCDA marks the sustained storage of task-relevant information in contralateral somatosensory cortex, it should disappear during the S2 period of shift trials. If delay period activity instead reflects the current focus of attention (van Dijk et al., 2010; Lewis-Peacock et al., 2012; LaRocque et al., 2013), tCDA components should emerge contralateral to the S2 pulse that was selected for memory update. A sustained tCDA component was elicited over somatosensory cortex contralateral to the memorized S1 pulse during the S1 period (between 0.5 s and 1.5 s after S1 presentation), demonstrating that participants could successfully establish a lateralized memory representation of this tactile stimulus. This confirms observations from a previous tactile WM experiment where participants had to memorize either one or two tactile pulses delivered to one hand, while ignoring tactile stimuli presented simultaneously to the other hand (Katus et al., 2014). In this earlier study, reliable tCDA components were found for both WM load conditions, and tCDA amplitudes were larger when participants memorized two tactile stimuli rather than one stimulus on the same hand. Further evidence for the load sensitivity of the tCDA was obtained in stay trials of the present experiment, even though tactile WM was now loaded sequentially, as the task-relevant S1 and S2 pulses were separated by a 1.5 s interval. The amplitude of the tCDA component on stay trials increased during the S2 period (between 0.5 s and 1.5 s after S2 onset) relative to the preceding S1 period (Fig. 2). Therefore, the sequential loading of WM with two tactile stimuli on the same hand enhances the contralateral delay activity similarly as when memory is required for two simultaneously presented stimuli (relative to memory for a single stimulus) (Katus et al., 2014). The central new finding of the present study is that there was also a significant tCDA component during the S2 period on shift trials, contrary to the predictions of the storage account. Critically, this tCDA was triggered contralateral to the location of the task-relevant S2 pulse. On shift trials, a tCDA first emerged contralateral to the memorized S1 pulse during the S1 period. However, it changed polarity after the task-relevant S2 pulse had been presented to the opposite hand (Fig. 2). In principle, this polarity reversal of the tCDA during the S2 period on shift trials could be explained if S2 would generally evoke larger tCDA components than S1. This possibility is ruled out by our observation that, on stay trials, the tCDA elicited by S2 (after correction for a pre-S2 baseline) tended to be numerically smaller than the tCDA evoked by S1, although this difference was not statistically significant. The tCDA polarity reversal on shift trials therefore points toward a privileged state of information implicated in the most recent cognitive operation (Postle et al., 2013; Zokaei et al., 2014). If the tCDA directly reflects memory storage, the presence of this component contralateral to the task-relevant S2 pulse would suggest that only this second stimulus was retained on shift trials, at the expense of the memory trace for the preceding S1 stimulus. However, this interpretation was not supported by behavioral data. If only the relevant S2 pulse was retained on shift trials, task performance should have been substantially impaired on trials where memory was tested for the relevant S1 pulse. Although performance was generally reduced for shift compared with stay trials (Fig. 4), there were no systematic performance differences when the location of the test stimulus matched with the relevant S1 or S2 pulse. Thus, both items were equally well retained on shift trials. These findings strongly suggest that the representation of task-relevant information in tactile WM can be dissociated from a sustained modulation of neural activity in sensory regions, as indexed by the tCDA component. A similar conclusion has been drawn from recent studies of visual WM that used multivariate pattern analysis (MVPA) (Harrison and Tong, 2009; Serences et al., 2009) to decode the identity of memorized objects from fMRI (Lewis-Peacock et al., 2012) or EEG signals (LaRocque et al., 2013). In these studies, a retro-cue specified which of two visually presented sample stimuli would be relevant for an impending memory test. This test was then followed by a second retro-cue and a second test. Even though the initially uncued stimulus had to be remembered because it could become relevant later, MVPA analyses did not detect an active neural trace for this unattended stimulus. A neural trace, however, emerged after this stimulus was marked as task-relevant by the second retro-cue. The observation that mnemonic content can be decoded from brain activity only while it is in the focus of attention suggests that fMRI and EEG measures are primarily sensitive to the attentional activation of stored information. Memory storage may be implemented by stimulus-specific changes in patterns of synaptic weights (e.g., Mongillo et al., 2008; Erickson et al., 2010), which would not lead to changes in brain activity that can be detected with fMRI or EEG methods (for further discussion, see Postle, 2015). Our observation that the polarity of tCDA components changed between the S1 and S2 periods on shift trials, where task-relevant S1 and S2 pulses had to be retained on different hands, contradicts the storage account. It is, however, perfectly compatible with the hypothesis that the tDCA primarily reflects the momentary distribution of attention in somatotopic space (Katus et al., 2015). The net change of tCDA amplitudes between the S1 and S2 periods (memory update effect; Fig. 3) was twice as large on shift trials, where attention moved between hands, compared with stay trials, where attention was reallocated between two fingers on the same hand. This suggests that the sequential attentional selection of tactile locations on different body sides produces stronger changes in the relative activation of the two cerebral hemispheres than the sequential selection of two tactile locations on the same body side. The reallocation of tactile attention between both hands may also account for the impaired performance on shift trials, compared with stay trials. In a previous tactile dual-task study, a secondary perceptual attention task selectively impaired memory performance, when spatial attention had to be withdrawn from the memorized location (Katus et al., 2012). Similar performance costs were found on shift trials in the present study. Finally, the task-relevant S1 and S2 locations were equally well retained on shift trials, although the relevant S1 pulse's location was not reflected by the tCDA component during the S2 period. This dissociation between behavioral and ERP data suggests that the sustained storage of information does not depend on an active neural trace (compare Lewis-Peacock et al., 2012). Our results are furthermore consistent with a multicomponent model of WM (Baddeley, 2003), which postulates distinct mechanisms for executive control and information storage. The close link between the tCDA component and the allocation of spatial attention demonstrated here is in line with the idea that attention acts as a rehearsal mechanism in WM (Awh and Jonides, 2001; Awh et al., 2006), through the selective activation of mnemonic content that is currently relevant to behavioral goals (Lepsien and Nobre, 2006). Attended items in WM are thought to have a privileged state, relative to mnemonic content that is not relevant to ongoing cognitive operations (Cowan, 1997; Oberauer, 2009; Olivers et al., 2011). The attentional activation of stored information leads to modality-specific delay period activity (e.g., tCDA component), which marks the interaction between selection and storage mechanisms in sensory cortex. In this context, it is interesting to note that an fMRI study (Riggall and Postle, 2012) found sustained delay period activity that was not stimulus-selective in frontal and parietal areas, whereas stimulus-specific information could be decoded from visual cortex using MVPA methods, in the absence of sustained activity enhancements in these posterior areas. These authors argued that sustained delay period activity reflects attentional control processes in higher-order cortex and that stimulus-selective WM storage is based on distributed patterns of neural activation in sensory areas that can be detected with MVPA, but not with univariate fMRI analyses. The present ERP results suggest that the maintenance of tactile representations is accompanied by a sustained modulation of neural activity in somatosensory cortex when focal attention is allocated to these representations. Unlike the sustained frontoparietal delay activity described by Riggall and Postle (2012), the tCDA component does not directly reflect attentional control processes themselves, but instead the effects of a flexible top-down attentional selection mechanism that modulates tactile WM representations in sensory cortex in a goal-directed fashion. The pattern of tCDA results observed in the present study therefore provides indirect evidence that sensory neurons contribute to the sustained storage of information in WM (sensory recruitment) (Jonides et al., 2005; Katus et al., 2014). In conclusion, the dissociation between electrophysiological activity and memory accuracy in this study suggests that somatosensory delay period activity marks the attention-based rehearsal of information in tactile WM. The lateralization of tCDA components is not directly attributable to an asymmetric recruitment of the contralateral versus ipsilateral hemispheres for the storage of somatosensory information in the brain but reflects the spatially selective allocation of focal attention. Our findings also point toward a privileged state for information that was used to update an existing memory representation during the most recent attentional selection process. This work was supported by the Deutsche Forschungsgemeinschaft Grants KA 3843/1-1 and KA 3843/1-2 and the Economic and Social Research Council, United Kingdom. We thank Anna Grubert, Moran Aharoni, and John Towler for constructive comments on the manuscript, and Sue Nicholas for assistance in setting up the hardware for tactile stimulation. (2001) Overlapping mechanisms of attention and spatial working memory. Trends Cogn Sci 5:119–126, doi:10.1016/S1364-6613(00)01593-X, pmid:11239812. (2006) Interactions between attention and working memory. Neuroscience 139:201–208, doi:10.1016/j.neuroscience.2005.08.023, pmid:16324792. (2003) Working memory: looking back and looking forward. Nat Rev Neurosci 4:829–839, doi:10.1038/nrn1201, pmid:14523382. (1997) Attention and memory: an integrated framework (Oxford UP, Oxford). (2003) Persistent activity in the prefrontal cortex during working memory. Trends Cogn Sci 7:415–423, doi:10.1016/S1364-6613(03)00197-9, pmid:12963473. (2007) Enhanced detection of artifacts in EEG data using higher-order statistics and independent component analysis. Neuroimage 34:1443–1449, doi:10.1016/j.neuroimage.2006.11.004, pmid:17188898. (2007) From cognitive to neural models of working memory. Philos Trans R Soc Lond B Biol Sci 362:761–772, doi:10.1098/rstb.2007.2086, pmid:17400538. (2010) A single brief burst induces GluR1-dependent associative short-term potentiation: a potential mechanism for short-term memory. J Cogn Neurosci 22:2530–2540, doi:10.1162/jocn.2009.21375, pmid:19925206. (1971) Neuron activity related to short-term memory. Science 173:652–654, doi:10.1126/science.173.3997.652, pmid:4998337. (2002) Transient storage of a tactile memory trace in primary somatosensory cortex. J Neurosci 22:8720–8725, pmid:12351747. (2009) Decoding reveals the contents of visual working memory in early visual areas. Nature 458:632–635, doi:10.1038/nature07832, pmid:19225460. (2005) Processes of working memory in mind and brain. Curr Dir Psychol Sci 14:2–5, doi:10.1111/j.0963-7214.2005.00323.x. (2013) The neural substrate for working memory of tactile surface texture. Hum Brain Mapp 34:1148–1162, doi:10.1002/hbm.21500, pmid:22576840. (2012) Common mechanisms of spatial attention in memory and perception: a tactile dual-task study. Cereb Cortex 24:707–718, doi:10.1093/cercor/bhs350, pmid:23172773. (2014) Electrophysiological evidence for a sensory recruitment model of somatosensory working memory. Cereb Cortex doi:10.1093/cercor/bhu153, doi:10.1093/cercor/bhu153, pmid:25013002, Advance online publication. Retrieved Jul 10, 2014. (2015) Sustained maintenance of somatotopic information in brain regions recruited by tactile working memory. J Neurosci 35:1390–1395, doi:10.1523/JNEUROSCI.3535-14.2015, pmid:25632117. (2006) Cognitive control of attention in the human brain. insights from orienting attention to mental representations. Brain Res 1105:20–31, doi:10.1016/j.brainres.2006.03.033, pmid:16729979. (2008) Synaptic theory of working memory. Science 319:1543–1546, doi:10.1126/science.1150769, pmid:18339943. (2002) Remembering over the short-term: the case against the standard model. Annu Rev Psychol 53:53–81, doi:10.1146/annurev.psych.53.100901.135131, pmid:11752479. (2010) FASTER: Fully Automated Statistical Thresholding for EEG Artifact Rejection. J Neurosci Methods 192:152–162, doi:10.1016/j.jneumeth.2010.07.015, pmid:20654646. (2009) Design for a working memory. Psychol Learn Motiv 51:45–100, doi:10.1016/S0079-7421(09)51002-X. (2011) Different states in visual working memory: when it guides attention and when it does not. Trends Cogn Sci 15:327–334, doi:10.1016/j.tics.2011.05.004, pmid:21665518. (2005) Working memory in primate sensory systems. Nat Rev Neurosci 6:97–107, doi:10.1038/nrn1603, pmid:15654324. (2006) Working memory as an emergent property of the mind and brain. Neuroscience 139:23–38, doi:10.1016/j.neuroscience.2005.06.005, pmid:16324795. (2015) The cognitive neuroscience of visual short-term memory. Curr Opin Behav Sci 1:40–46, doi:10.1016/j.cobeha.2014.08.004. (2013) The positional-specificity effect reveals a passive-trace contribution to visual short-term memory. PLoS One 8:e83483, doi:10.1371/journal.pone.0083483, pmid:24386212. (2003) Flutter discrimination: neural codes, perception, memory and decision making. Nat Rev Neurosci 4:203–218, doi:10.1038/nrn1058, pmid:12612633. 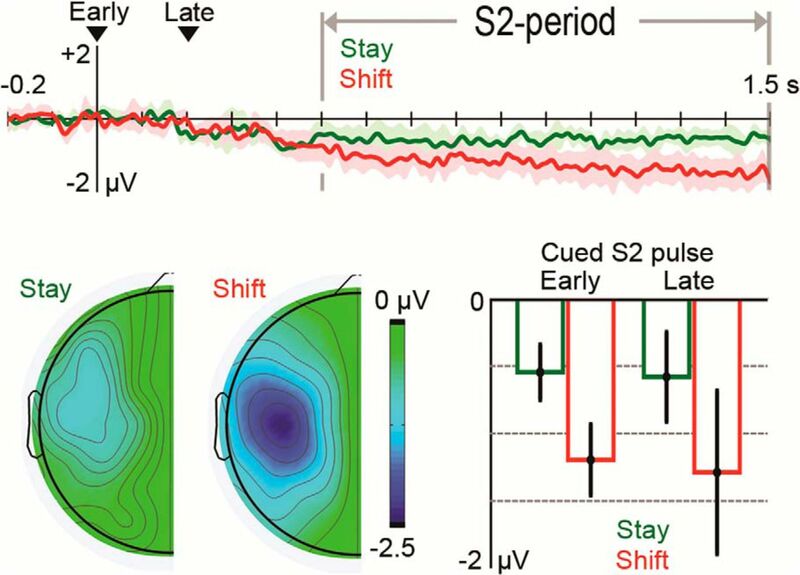 (2009) Stimulus-specific delay activity in human primary visual cortex. Psychol Sci 20:207–214, doi:10.1111/j.1467-9280.2009.02276.x, pmid:19170936. (1998) Shape selectivity in primate lateral intraparietal cortex. Nature 395:500–503, doi:10.1038/26752, pmid:9774105. (2014) Revisiting the role of persistent neural activity during working memory. Trends Cogn Sci 18:82–89, doi:10.1016/j.tics.2013.12.001, pmid:24439529. (2010) Modulations in oscillatory activity with amplitude asymmetry can produce cognitively relevant event-related responses. Proc Natl Acad Sci U S A 107:900–905, doi:10.1073/pnas.0908821107, pmid:20080773. (2004) Neural activity predicts individual differences in visual working memory capacity. Nature 428:748–751, doi:10.1038/nature02447, pmid:15085132. (2001) Synaptic reverberation underlying mnemonic persistent activity. Trends Neurosci 24:455–463, doi:10.1016/S0166-2236(00)01868-3, pmid:11476885. (1996) Mnemonic neuronal activity in somatosensory cortex. Proc Natl Acad Sci U S A 93:10533–10537, doi:10.1073/pnas.93.19.10533, pmid:8927629. (2014) Causal evidence for a privileged working memory state in early visual cortex. J Neurosci 34:158–162, doi:10.1523/JNEUROSCI.2899-13.2014, pmid:24381277.